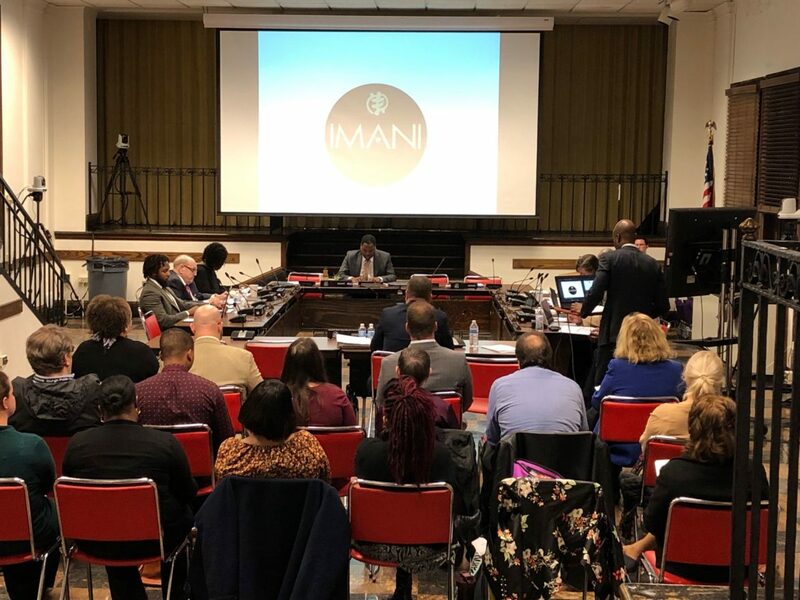 Officials of Imani Christian Academy made it clear to the Pittsburgh Public Schools board on Tuesday evening that should their application to convert to a charter school be approved, they would remove all religious aspects of the education it provides. At the same meeting, findings of the district’s charter review committee were presented on Imani’s application to convert to a charter school. One of the concerns expressed by Lisa Augustin, director of charter schools for the Pittsburgh district, was whether Imani, founded as a Christian school in 1993, could easily transition from its faith-based mission to a secular school. The concerns were based in part on the fact that the curriculum as stated in the charter application includes “theological studies,” that the terminology “Christian nuance” was used repeatedly throughout the science curriculum and that a religious studies teacher was listed among the staff. McKenna said if Imani officials had been given a chance to respond to the district’s findings on the application, mistakes could have been corrected and additional information could have been provided. But, he said, that was not possible because the report on the committee’s findings was given to them 10 minutes before the public meeting. It was a complaint that he and Nzambi would repeat throughout the meeting. But Augustin and district solicitor Ira Weiss said the district was using the same process it uses for every charter application. That process calls for the charter application to be submitted, with all necessary information required by the state by a Nov. 15 deadline in the year prior to when the school hopes to open. Imani’s application cited a fall 2019 opening and was submitted by the deadline. The next step in the process is to hold a public hearing on the application, which took place on Dec. 17. Then a district review team analyzes the application and presents its findings publicly before the board takes a public vote on the application. School board member Regina Holley put it bluntly: “It is not the district’s responsibility to write your application,” Holley said to Imani officials. Despite McKenna’s assurances about what will be a secular mission for Imani Academy charter school, it appears there may not be enough support among the board for an approval of the application when the board votes on Feb. 27. Holley and school directors Kevin Carter, Cynthia Falls, Sala Udin and Terry Kennedy expressed concerns Tuesday about the lack of information in the charter application and additional findings of the review committee that included concerns about special education, lack of detail about curriculum, past financial issues and lack of documented public support. The district’s review team cited various reasons the Imani charter application did not include all of the information required under the state Charter School Law. The team also expressed concern about Imani’s ability to shed its tradition of Christian-centered education. Read more on Imani Christian Academy and its application to become a charter school. The review team, headed by Augustin, included 15 district employees and Robert Isherwood, an associate professor of special education at Slippery Rock University and a consultant to school districts on special education issues. Augustin focused heavily on the fact that the Imani Academy charter application included no specific curriculum or accommodation plans for special education students and no special education teacher or director listed among the staff. Nzambi said it does not have a specific curriculum because the school currently does not have a significant enrollment of students with disabilities; however, he said, its proposed charter application included a budget allocation to create a special education program if necessary. Other review committee findings concerning academics included a lack of curriculum aligned to the Pennsylvania Core Standards, no student code of conduct, a limited professional development model and lack of evidence that the proposed charter school would offer educational options not already available in Pittsburgh schools, as is the intent of the state charter law. The committee also found a lack of “demonstrated, sustainable support” for the proposed charter. Its report pointed to the fact that of 20 speakers at the Dec. 17 public hearing, 15 were either a teacher, board member, existing school staff or someone who assisted with the application and four speakers identified as a parent or community member. Of the four, only two were Pittsburgh residents. Of the 161 signatures collected in support of the charter school, 35 percent were not Pittsburgh residents and 29 percent were younger than 18, leading to speculation that they were Imani students. In addition, they included no letters of support or partnership agreements with the application. Another wrinkle emerged regarding Imani’s building. Imani purchased the building it operates within from the Pittsburgh district for $1 million in 2008. The review team found an addendum to the November 2008 sales agreement for the property — the former East Hills Elementary School — to Imani Christian Academy that prohibited the property from being used as a charter school. Augustin also reported on past deficits reported by Imani Christian Academy on its IRS 990 forms. Those deficits, reported previously by PublicSource, included $222,123 in 2013, $402,379 in 2014 and $526,292 in 2016, the most recent year available. But the review committee report found the school would be financially viable as a charter school collecting tuition for students from school districts. Holley asked Imani officials if the conversion to a charter school was about money. Nzambi said it was being done to provide access for more students. He said the tuition currently charged, though “modest,” is enough to create a barrier for some families who would like to attend the school. The Imani website says tuition and financial aid are based on income. As a charter school, students’ tuition would be paid by their home school districts. The Imani Academy charter application calls for an enrollment of 230 students. Imani Christian Academy enrolled 198 students in the 2017-18 school year, according to the state Department of Education. Nzambi estimated that 40-45 percent, “maybe slightly more,” of the current students are from Pittsburgh. District officials asked how current Imani students would access the charter school given the requirement for open enrollment and a lottery should applications exceed spaces. Nzambi said the charter law allows for the children of parents involved in the charter application process to have preference in enrollment. But he acknowledged that not all current Imani parents are involved in the charter transition effort. The school board will vote on the Imani Academy charter application at its Feb. 27 legislative meeting at 7 p.m.
Mary Niederberger covers education for PublicSource. She can be reached at 412-515-0064 or mary@publicsource.org. PA schools no longer get a single grade. But the state still uses them to rate teachers. Explore the Allegheny County scores. The Future Ready Index replaced the School Performance Profiles [SPP] the department had used since 2013 to report overall annual progress and academic achievement in the state’s public schools. The SPPs are still used as a measure of effectiveness for teachers and principals. I say enough with the failing schools narrative. Teachers perform miracles every day for our students. "Racial achievement gap? The only chasm is between our poor vision of what counts as achievement and the real-world excellence these children demonstrate every day," writes Steven Singer, a teacher at Steel Valley Middle School. Experts who study the achievement gap between black and white students told PublicSource the disparities are more an issue of equity than ability. They cite such contributing factors as socioeconomics, implicit teacher bias, disparate discipline and lower expectations projected on black students.